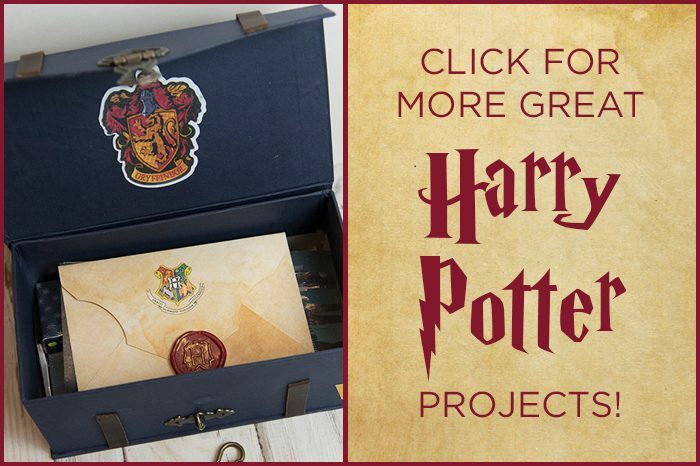 An excellent Hogwarts letter is the key piece of a Harry Potter surprise treasure box. I knew I wanted to do it up, to make a really cool replica compared to the movie props, so I searched high and low to find the best projects, and I compiled them into a single place here. This post will link the places I’ve used for inspiration, and then how we made changes or revisions to make it our own. I have to confess, this one had some challenges. 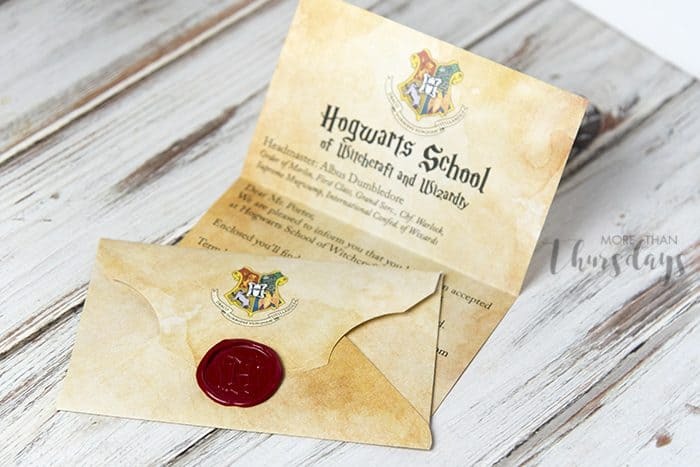 I ended up printing the address and Hogwarts seal and then using my Silhouette die cut machine to cut it out. Download the 4 Privet Drive font from here for the PERFECT look to your address! The steps here are a little more complicated, but hopefully, this will take you through them easily. Open the envelope template PDF in Word. 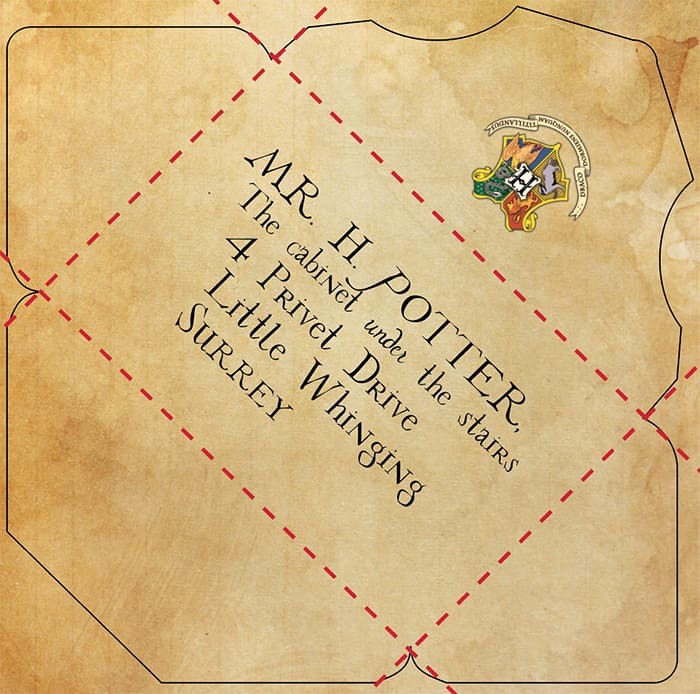 Use the 4 Privet Drive font to type in your recipient’s address. Center the address on what will become the front of the envelope when folded. 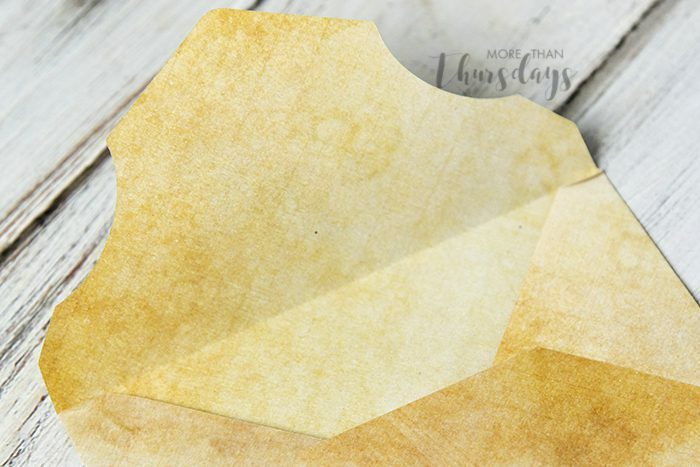 If you’re using the tea-stained PDF, print the second page of the file to get the colored back on your paper, so it shows on the inside of the envelope. Once your envelope is printed out, carefully cut along the lines, or I’ve got an SVG file here for the envelope outline, so you can use this to cut it out on your Silhouette! Crease and then glue the envelope and you’re done! I stumbled upon this blog post and loved his attention to detail. (He’s even the one who designed the Privet Drive font!) 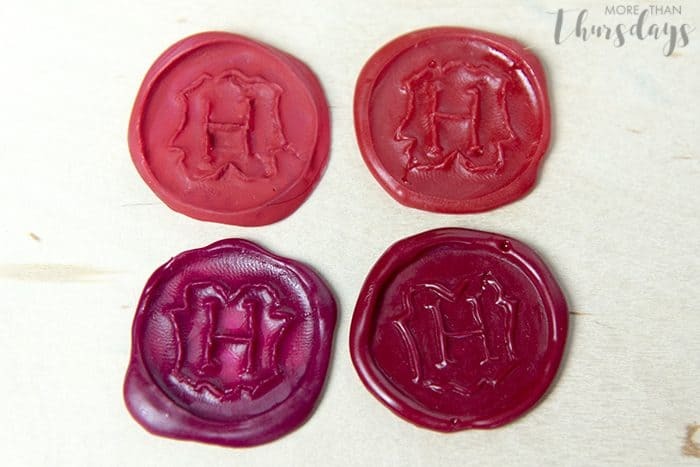 We were really inspired by his Harry Potter wax seal tutorial, so read there for all the details, but we made some changes. Our stamp is molded from a larger piece of FIMO, instead of using the coin backing. Once it was baked, Jamie sanded the face of the stamp to smooth it out and then used the Exacto to clean up the edges. Instead of painting the glue seals, we found that melting about 1 part red crayon to 3 parts hot glue made exactly the look we were going for. Our experiments are as follows: Top left: Painted (acrylic craft paint) hot glue, Top right: Red crayon and hot glue, Bottom left: Magenta crayon and hot glue, Bottom right (the winner): Combo of Red and Magenta crayon with hot glue. Melt a piece of hot glue stick and red crayon together and then apply to the stamp, no glue gun needed! Help! 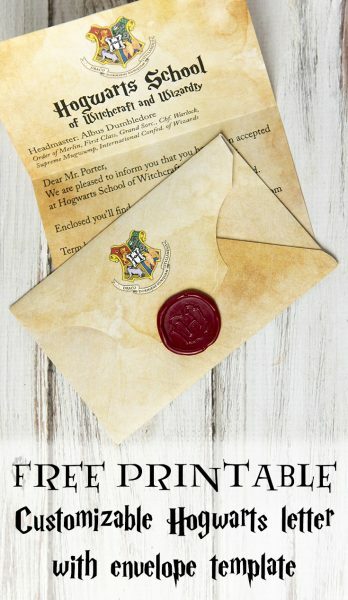 The Hogwarts letter on white has a different file name from the parchment one but they are both the same pdf. Hi Mary! Thanks so much for the heads up! I’ve fixed the link, and will email you separately as well. Thank you so much! This was great! I did find myself wishing you went over how to fold the letter to fit in the envelope! ? Hi Nell! I actually printed the letter scaled down to about 75% so I could just fold it in half for my purposes. Love this envelope! How did you melt the glue and crayon together? I cannot seem to use the letter as it saves as a PDF I cannot edit. Also both letters come up white. 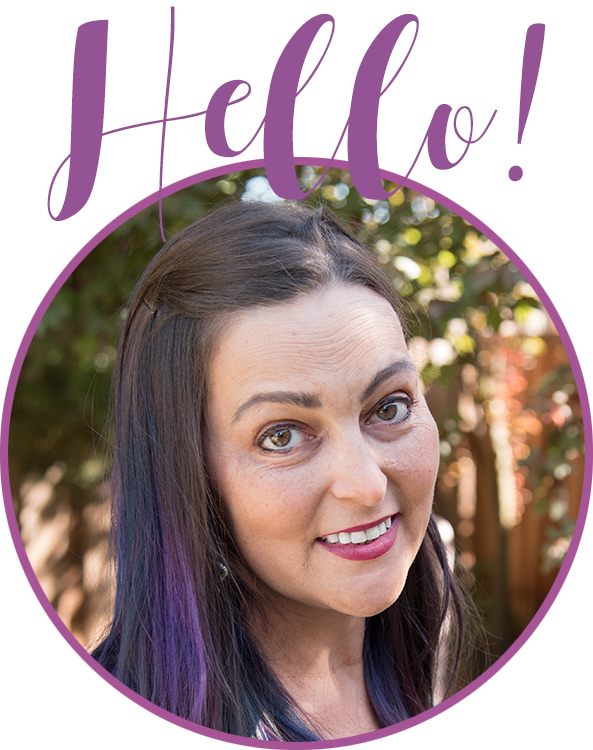 Hi Kristen! Thanks for stopping by! It looks like my links got screwy for the tea-stained version, I’ve updated the link, and I’ll paste it below as well. As for filling the PDF, make sure you’re saving it to your computer and opening it in Adobe Reader, not in your browser. Hey, I would absolutely love to download and print the documents you provide, but cannot seem to access the dropbox 🙁 is something wrong? I’m sorry you’re having trouble… the links go through to Google Drive files, and all looks like it should be working from my end. Let me know if you’d like me to email the files directly! Everything is working out great except for when I print it out it cuts part of the letter off after “at” and that follows all the way down like somebody chopped it off. I hope I’m explaining it right. Are you seeing the whole letter on your screen? It sounds like maybe your printer setup is going the wrong orientation. Hey the editing text in adobe reader is not in Harry Potter font despite installing the Harry Potter font…. what do I do? Pooja – I had a similar issue. I suspect it’s because it’s the free version of Adobe that I have installed. I ended up just copying the text into word and editing the font from there instead. I had to print onto parchment though. Thank you so much for posting this information! 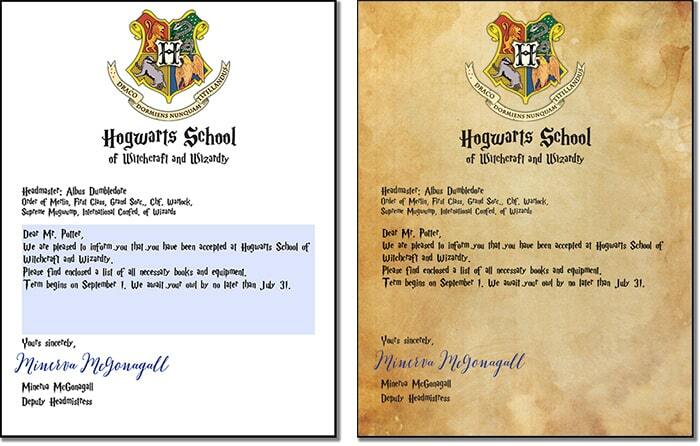 We are visiting HP Studios this weekend so I wanted to send a ‘prospective students’ invite to my kids. They are 9 & 7 so are not technically old enough to go to school there 🙂 I couldn’t get the font to work in Adobe so I copied some of the text and pictures into word and used the font there instead and printed on parchment. The font was awesome! I printed the envelope on A3 paper and the letter on A4 paper and that helped it fit. I also included a ticket for the Hogwarts Express and the Knight Bus in the envelope which also went down really well with them! Thanks again! Did you ever find it? I am still looking. Thanks for the awesome instructions. We made our own version. Here’s a making of video. Where is the link for the white background letter? it says they won’t convert? could you make it more clear on how to open it up in word. Hi. 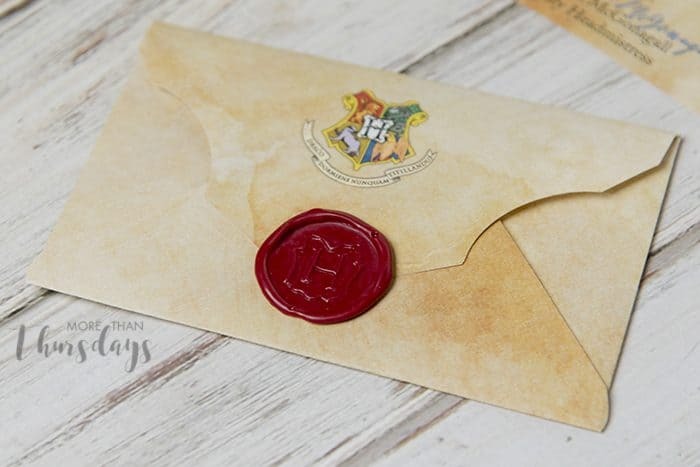 Is there a printable version (white background) with the Harry Potter address already on it? I don’t want to customize just make them to decorate with his address. This is fantastic! Got the letter all set with the fonts. Very simple instructions, thank you! I am however stuck with the envelope. I have downloaded the PDF, have got the addresses ready in a text box at 45 degrees on Word but that’s as far as I can get! I’m stuck trying to add the text box to the PDF as I don’t have the ability to do that. Am I missing something? Love the PDF..thank you! The body of the letter is not printing in the same font. I was also modifying the text and was wondering if there is a way to modify the font and text size so I can fit everything? hello! it looks great, but i cant open the file onto adobe reader and i cant edit and cant figure out what to do lol! I’m taking my kids to HP world in Orlando next month. Do you have an example for the wording you used? Thank you for sharing all of this! !